Hello friends hope you all are fine and well. I couldn’t write any Proteus tutorial for quite a long time actually I was very busy in programming stuff. Anyways let’s come to the today’s tutorial, yesterday I got a mail from a student in which he asked me to help him out about Proteus. According to him, he is good in programming but not much in electronics and wants to test his circuit first on Proteus and then want to make PCB of it. After reading his email, this thing clicked my mind that I didn’t post any tutorial on Proteus on TEP. So today I thought of posting about it. If you guys have any problem anywhere, ask in comments and I will try my best to resolve your issues and also subscribe to our newsletter so that you get these burning tutorials rite in your mail box. I will continuously update this list of tutorials so that we have kind of a database and you guys can find all the tutorials in one place. Let’s come towards the tutorial. If you guys want tutorial on any topic, dont hesitate and just write it down to me using the Contact Us form. Moreover, you can also join our Proteus Group on Facebook. In today’s part, we will just have a look at the complete course which we will cover in this tutorial. I am calling this a chapter zero of this tutorial. In first part of this tutorial, I will introduce few features of Proteus which are very essential for a beginner to know. In second part, we will design a complete circuit using Proteus. I will design a LCD circuit using PIC microcontroller and then I will show you how you can test your PIC code in Proteus. In third part, we will discuss the various components available in Proteus. I know there’s countless components in its database and we can’t discuss them all but we will discuss which are commonly in use by the students like motors,serial port, microcontrollers etc. After that, we will see how to design a component in Proteus if it’s not already in its database. Its important when you need to design a PCB in Proteus. After that, we will finally design our PCB in Proteus, both single layered and multi-layered. In the end we will see how to design a package for a component, if its not already in Proteus. May be some guys don’t know about it but sooner you will get it. In the last part, I will post on request if something’s left in the tutorial. So, that’s the whole course for this tutorial. Now, I am writing the names of the parts below and as soon as I post the chapters I will update the links here. All of them available now, you can click them below or can also get access to them from the above table. I have started this thread as a simple tutoriaal on Proteus but because of the readers’ responses I have extended it to next level. Below are mentioned, all the projects designed by TEP team in Proteus. 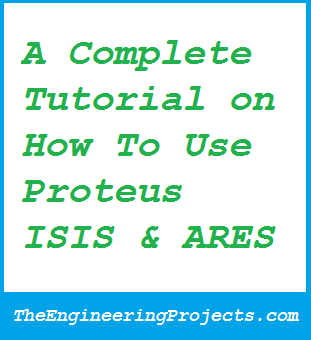 Below mentioned are the basic tutorials on Proteus. If you are new to Proteus then these articles will be a good starting point for you. Read all of them carefully step by step andalso implement them one by one. They will really enhance your knowledge about Proteus. How to Install and Download Proteus Software ? Proteus has a wide range of components in its database. USing these components you can design almost any kind of circuit and can test and debug it. Below tutorials mention few of these components, which are most commonly used while working on Proteus. How to Design a DC Power Supply in Proteus ? Arduino is most widely used Microcontroller board these days, which is famous for its flexibilty and ease of use. Arduino board is not available in Proteus but we have provided with Arduino libraries using which you can quite easily use Arduino in Proteus and can test your circuits in Proteus before implementing them in hardware. Below are the tutorials and projects in which we have used Arduino in Proteus. Proteus not only provide the capability of circuit designing and testing but also provide the facility of designing a PCB. Proteus comes with two packages one is named as Proteus ISIS in which we design our circuits and the other one is Proteus ARES which is used for PCB designing. Here we have post tutorials on How to design PCBs in Proteus. So these are the tutorial on which I have written. If you guys stuck at any point, feel free to ask in comments and I will try my best to satisfy you as much as I can. Moreover subscribe to our mailing list so that you get these tutorials rite into your mail box. Stay blessed & take care. So stay tuned to get such exciting tutorials. hi eng, sayed i would like to ask you about the best source [book /site] to learn C (advanced level) & assembly (from scratch)…. i know this question does not relate to the tutorial, excuse me. Buy a book named ” PIC Programming” by Mazidi …. ITs one of the best book for learning assembly language. thank you, about the C programming language ? Give your email ID …. very nice tutorials. can you please send me the software? can u send me the proteus software also? please…thank u. Give your email id please …. plz, send me source code for 3 phase smart energy meter in c language. Thanks. it really helped me a lot. Your email ID is not appearing in our subscription list …. Kindly subscribe first and the software will be automatically emailed to you. Please provide me the link to get proteus.! you and your team is doing a tremendous job. i want Matlab software,Can you send me this software?? Thank you for sharing your valuable knowledge,Kindly send me the proteous software to my mail id i.e adarsh33success@gmail.com, I will be grateful to you for this. I will be waiting for your response. Can you tell me where can I find more libraries to use with Isis/Ares? What can I use on Isis as a symbol for a toggle switch? What I need is a toggle that will allow me to select between to inputs, with just one output. What are the symbols I may use for V+ and V-? I found only that inverted triangle with a line. Are there any others? Are there forums for Isis/Ares besides the official one? There’s no library for hall effect sensor for Proteus available so you can’t use it in Proteus. I am designing a solid state marx generator on proteus. However it always shows the error ‘time step too small’. Please help me to solve this error. I have also tried connecting a high value resistor in parallel to the capacitor. The error stopped but I am not able to get desired output. Hmmm send your simulation on my email or skype n I’ll check it out. Hi all.thanks for your Proteus Tutorials,they were great. I’m Alireza Mashofi and studying Power_Electrical and I’m in my forth year.I want you to give me some information about which microcontroller is the best and what microcontroller do you suggest? I got confused.at the present time I have learned AVR and a little about ARM but when I was reading your tutorials,I saw you mostly use PIC and Arduino. I also have a question about my assignment that my teacher has given me to do.my assignment is :Write an Assembly Program for getting a character by means of Keyboard and Morse Code produced by an Output Port. I have written its program but i wanted to burn it into microcontroller and simulate it into Proteus. if you have any help,please give it to me. I urgently need this software. I want to know to gas sensor i.e. MQ6 interface with pic 18f4520 in Proteus. Can u assist us about simulation of it. its must need to us. Add me on Skype and we will discuss it. My Skype id is theenggprojects. can you please send me proteus and Mikroc pro software pls. i want to know if we can simulate a GSM based AUTOMATIC ENERGY METER in proteus. the main copmonents in my project are : GSM module, AT895s2 microcontroller, max 232, eeprom, lcd and an energy meter for providing electrical pulses. Yes we can provide the complete simulation to you. Add us on Skype and we will discuss it in detail. Everytime i run a simulation on proteus it shows error cannot open mingw\bin.sdf.I have also tried installing other versions of proteus e.g 7.8 but all of them show the same error,please help me solve this problem. Hi, i’d like to ask ,if i can simulate a 3-phase inverter in proteus for driving an ac motor using spwm teqnique. I know that i can’t simulate ac motor in proteus, i wonder if i can only see the outputs using an oscilloscope in order to test my code.Thanks . can i get objective type questions on Proteus. hey i need to do a project for my college , can you help me? Yeah we do students projects so can help you out. Add me on Skype. Is there any tutorial on how to use Proteus to burn source codes directly to micro-controller? can u please send proteus 8 software with key to mu mail id.. i tried many download links but not getting the working key..
Sir, can u teach me on how to send a gps data to a microcontroller pic16f877a using easy hdl generator in proteus??? I dont know how to simulate it… please sir i need help… im running out of time… i just need a proteus file on which a microcontroller is connected to an HDL. About the coding… ill try my best sir. Please help me, i am BS EE student. Please sir, send me a proteus file that could help me. Im trying to interface gsm and gps. Kindly add me on Skype and we will discuss it in detail. My Skype id is theenggprojects. We can provide you this complete simulation for $50. I’m building car tracking device using Arduino UNO. simulatig the circuit on proteus results in error AVR not defined. P.S i’ve given the right path to controller. can u please send Proteus 8 software with key to my email id.. I tried many download links but not getting the working key..
Sir, please help me how to configure the transformer properties (the primary and secondary inductance) so I can get desired output. I use tran-2P2S. For example I can get 15VAC, 3A from Vsine with 220V, 50Hz. If you have the formula, could you share with us. I hope you mean this formula for the transformer. send me this software plz. my id @rubyshukla841@gmail.com. Hello, please excuse my english is no so good. I speak Spanish. I am install Proteus 8 Profesional on my PC and it run ok but no load any libraries. I read the tutorial and do what it says but the software is tell that ¨No Library found¨. ¿What can i do? ¿Is mi software wrong or corrupted? Is a craked proteus 8.Please help. I am actually work whit Multisim 14. Is a godd software but i want to tried whith something new and Proteus is look like a good software for Simulation and PCB Design. I want to thank the creator of this page, in my country and very difficult to know about proteus, the designers do not provide much, I have developed on my own, and now the company I work with was negotiated with a Mexican group and I have to realize many projects and I need urgently of knowledge in Arduino and other projects for new technologies that I develop in my company. Thank you, from now on we will be in touch, I am available if you need help. Hi sir, can you please create an AC power meter using arduino and PZEM-004T through Proteus. Hi, can you please create a PZEM-004T library for Proteus. hi there I am new on embedded system and trying to learn it, could you please send me proteus so I can start learning step by step, thanks a lot.